Ancient literary sources were very familiar to 18th-century artists, who consulted them for historical inspiration. This episode from Roman history is based on the Greek historian Plutarch's Life of Marc Antony, written around 100 CE. A Roman sword, discarded in the chaos, lies on the floor. Another Roman soldier follows Proculeius into the tomb. The setting is a dark, gloomy, and plain tomb interior, not an elegant royal palace. Egyptian-style lotus capitals on the tomb columns reinforce the Egyptian setting of the scene. The Roman officer Proculeius, made prominent by his unusual helmet and light-colored cloak, grasps Cleopatra's arm to prevent her suicide. Cleopatra grasps a dagger in her right hand, ready to take her own life. Cleopatra, queen of Egypt but of Greek ancestry, wears a type of diadem associated in the 18th century with Greek royalty. 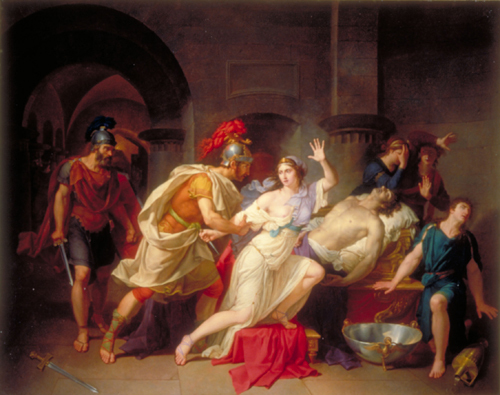 Infrared photography of this painting revealed the artist's change of mind: Cleopatra's left arm, flung up in a dramatic gesture of shock and surprise was originally extended out straight. The dead Antony lies on an elaborate gilt couch, with leg supports in the shape of sphinxes. His body is wrapped in purple cloth, a color signifying Roman imperial dignity. Female attendants mourn Cleopatra's capture; these are likely "stock characters" based on figures seen in prints. A mourning young man wears the rough tunic of a slave or servant; he is likely a "stock character" based on figures seen in prints. Infrared photography of this painting revealed the artist's change of mind: Antony's left arm originally extended out, allowing his hand to hang over the edge of the couch. Gold and silver vessels sit abandoned next to the royal bed. The large silver bowl is supported by a gold stand formed by three ibises with snakes in their beaks. The painting is signed BDuvivier 1789 in the lower right corner.